Abstract: From a technological point of view, the synthesis of new high-silica zeolites is of prime importance owing to their high potential as industrial catalysts and catalyst supports. We report the synthesis of two such materials made up of the 1,3-stellated cubic unit (hexahedral () bre unit) as a secondary building unit, with the aid of existing imidazolium-based structure-directing agents under ‘excess’ fluoride conditions. One of them, denoted PST-21, is the first aluminosilicate zeolite consisting of 9-ring apertures solely, with exceptional activity towards skeletal isomerization steering of 1-butene to isobutene, which bridges the gap between small and medium pore structures. We also describe a series of hypothetical structures nonjointly built from the bre unit, all of which are chemically feasible and will thus be helpful in designing the synthesis of novel zeolites containing 9-ring and/or 10-ring channels. 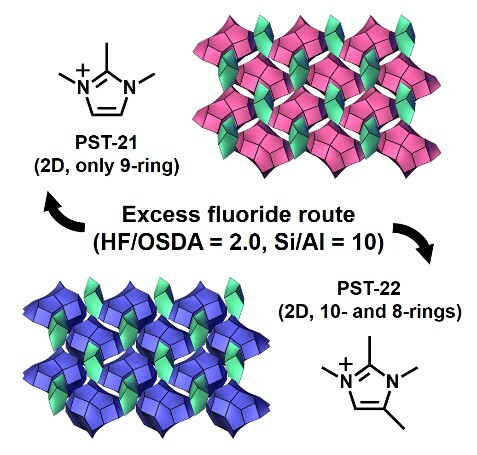 Novel zeolite structures: PST-21, the first aluminosilicate zeolite containing 9-ring channels only, as well as PST-22 with both 10- and 8-ring apertures, has been synthesized using methyl-substituted imidazolium cations under excess fluoride conditions.